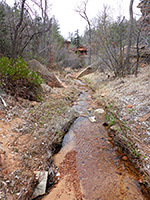 In the low elevation southwest corner of Zion National Park, Coalpits Wash is a relatively minor drainage that generally has flowing water all year, at least in some sections; it starts in a shady, cliff-lined valley beneath the high peaks of Towers of the Virgin, then encounters progressively more open, desert-like surroundings as it moves towards a confluence with the Virgin River, 2 miles west of Rockville. 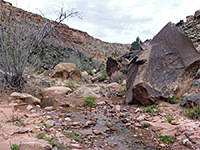 The lower end is crossed by Hwy 9 and is served by an NPS trailhead, from where a well-used path heads upstream over sagebrush flats for 1.7 miles with to the tributary of Scoggins Wash, and continues through a narrower section with big boulders, to a junction at the far end of the Chinle Trail, after 3.6 miles. Beyond here, the path beside Coalpits Wash gradually fades away, though it is still quite easy to continue, all the way to the head of the drainage, around 8 miles from the start. 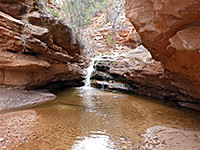 Towards the upper end are some pools, cascades and shallow narrows, though the canyon is never properly enclosed. This area of the park is quite popular with backpackers between fall and spring - although the scenery is not so spectacular compared with places further east, the region is peaceful and little visited, and does not receive much snow in winter. In summer conditions are generally too hot for extended hikes. Coalpits Wash topographic map, location map for Zion National Park. 24 views along Coalpits Wash. The trailhead is at a pull-out beside the highway, just east of the bridge over the wash. 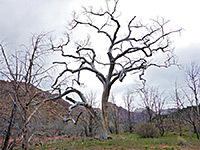 The Virgin River flows close by to the south, hidden behind a belt of trees and bushes. A sign warns against camping at the trailhead, while another a short distance down the path has information about the hike. The wash at this point is enclosed by low, ledgy, dull brown cliffs of the Moenkopi Formation, some parts of which are overlain by black basalt from ancient lava flows. 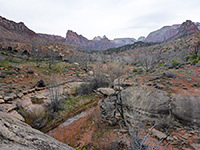 The trail follows the east side of the canyon, not too close to the creek bed (which is often dry at this point), initially through a grove of tall cottonwood trees then over sagebrush flats, crossing a few minor, steep-sided gullies and passing under some powerlines, followed by a sign marking the edge of the Zion Wilderness. The valley is now nearly one mile wide. 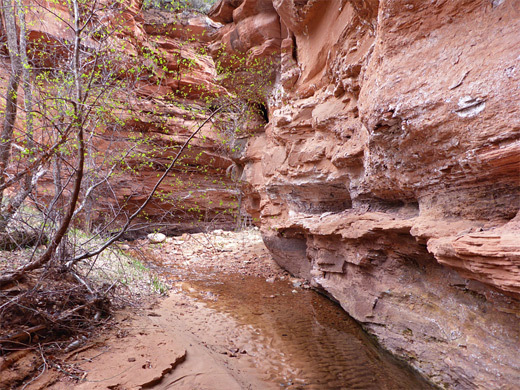 The path comes closes to the creek bed briefly - now usually containing some water, climbs to the top of a low bench and follows this for a while before returning to the stream and continuing to the confluence with Scoggins Wash, which is more likely to be dry. 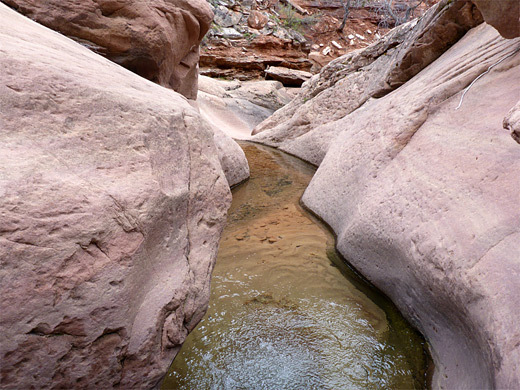 The canyon is now much narrower, and ahead, both drainages are filled with big, multicolored boulders. Scoggins Wash can be followed 2.4 miles to a junction with the Chinle Trail, while the main route is still up Coalpits, and the path remains obvious though a little more testing, as it winds through the boulders and up and down little ridges. 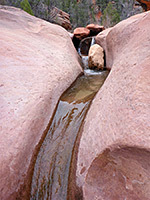 The streamway becomes shallower after a mile or so, and contains fewer large rocks, so walking is easier, and mostly on the east side of the stream until this flows through a short enclosed, reed-lined channel; here, the path moves to the west, above the narrows, then rounds a bend and arrives at a wide, flattish area where it meets the Chinle Trail, marked by a sign. This point is at the head of the lower valley of the creek, and for several miles upstream the drainage is not enclosed, instead winding across undulating, bushy land with views of the high, red and white cliffs from where the stream originates. Another notice indicates the location of a primitive campsite. The next half mile is over a wide, sandy flat, sprinkled with large cottonwood trees mostly killed in a recent wildfire. 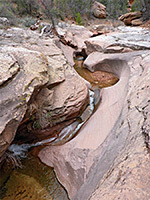 The stream is then bendier, curving through low reddish hills, and the path is fainter - often visible across bends but fading away in the straighter sections, where the route is directly along the streambed. Red cliffs approach on both sides - Cougar Mountain to the north, Towers of the Virgin to the south, and pines tree start to grow in the shallow canyon. One section contains quite a few boulders, slowing progress somewhat, but these soon give way to another more open stretch, site of limited oil explorations in the early 20th century - relics include some rusty equipment and a few black pipes, and oil seeps are visible on some of the sand banks near the stream. The oil is associated with the Chinle Formation, unlike the coal after which the wash was named; this instead is an erroneous reference given by early settlers, on account of the black basalt along the lower portion of the drainage. Jennings Wash joins from the north (5.9 miles from the start), containing about half as much water as Coalpits Wash, which continues northeastwards, through a few bends and then fairly straight, and still quite wide. A lesser tributary joins on the right, originating a short distance away beneath the Altar of Sacrifice. 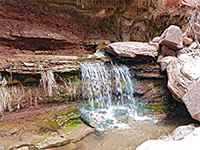 After two more bends, Coalpits forms a little cascade over some thin-layered strata, beneath an overhanging cliff; this is the start of a half mile section of narrows, with cliffs on one or both sides of the canyon, and various pools, waterfalls, cascades and chutes along the stream. Some wading might be required in a few places, though there are no major obstructions. 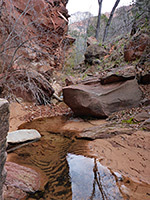 Past here, the very upper end of the canyon becomes gradually steeper and more overgrown, and the wash splits into several branches; the end of interesting part, above the narrows, is 8 miles from the trailhead.